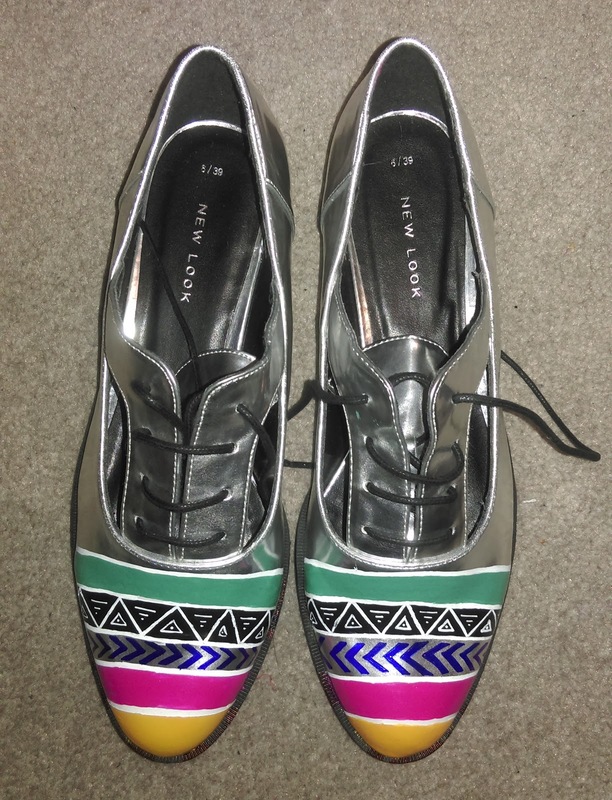 I extremely love shoe DIYS! 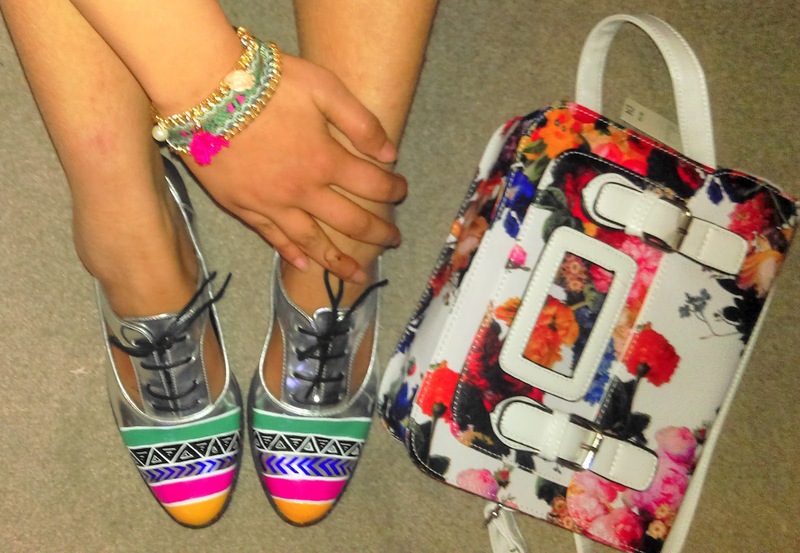 If given a chance I would do shoe and bag DIYs alllllll day alllllll night for as long as I can! But since I don't get to spend that much time on my DIYs, I occassionally do some quick ones every now and then to appease my creative side. 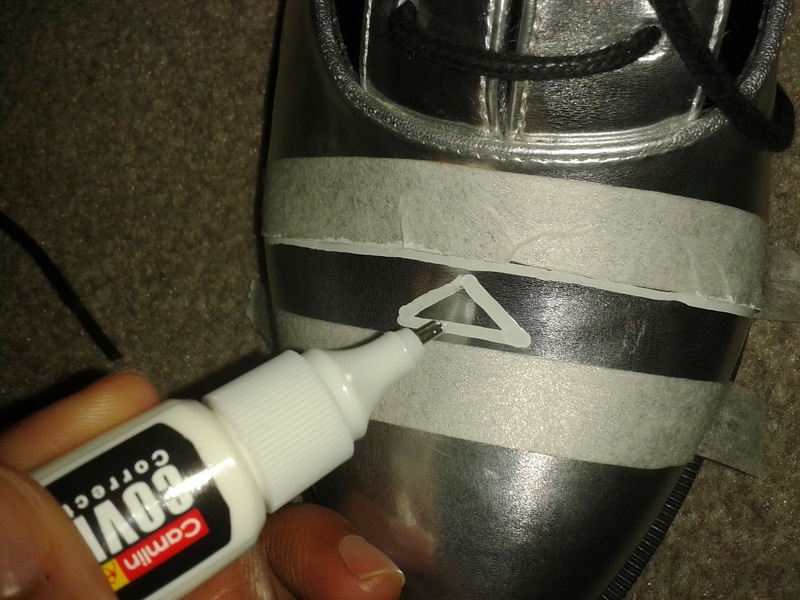 So, here's an easy DIY to give some life to a simple and plain pair of shoes. 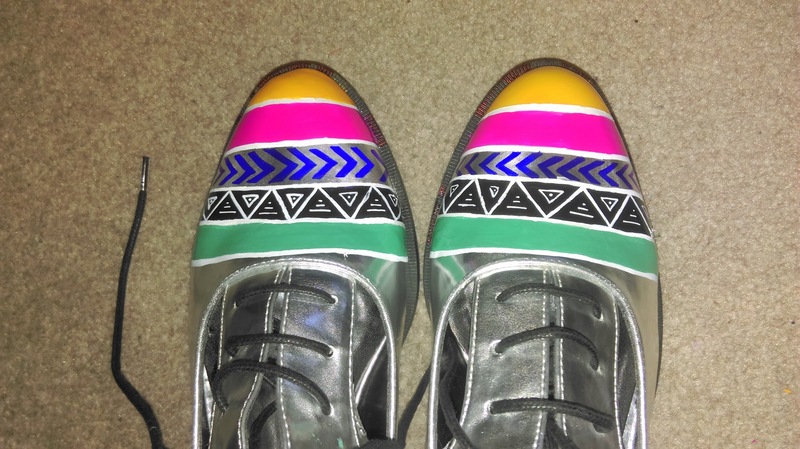 Now, the reason I coloured my shoes so bright is because I have been looking for a pair of shoes that would compliment my colourful tropical accessories for my exciting upcoming holiday in CHILE! 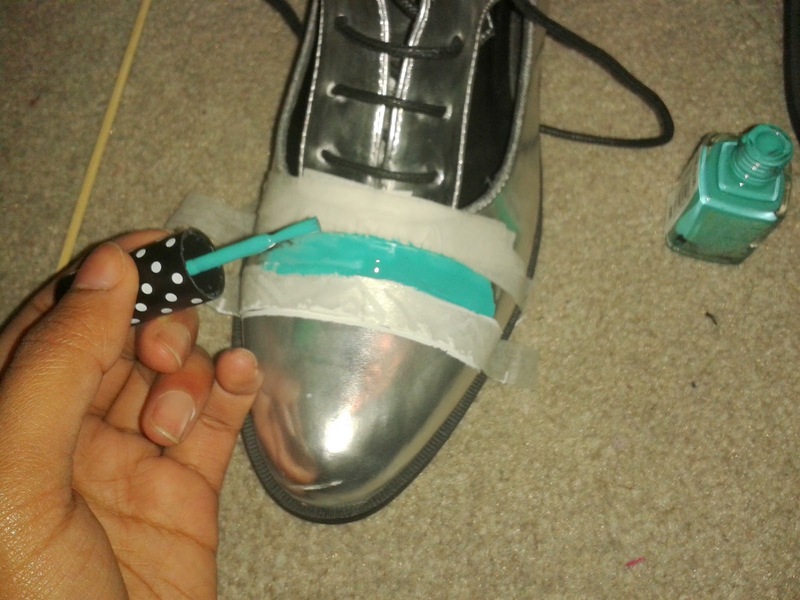 Hence, inspired by the very feel of it, and since I couldn't find a decent pair of colourful shoes anywhere, I decided to buy myself a plain pair of shiny shoes and get DIYing on it instead! 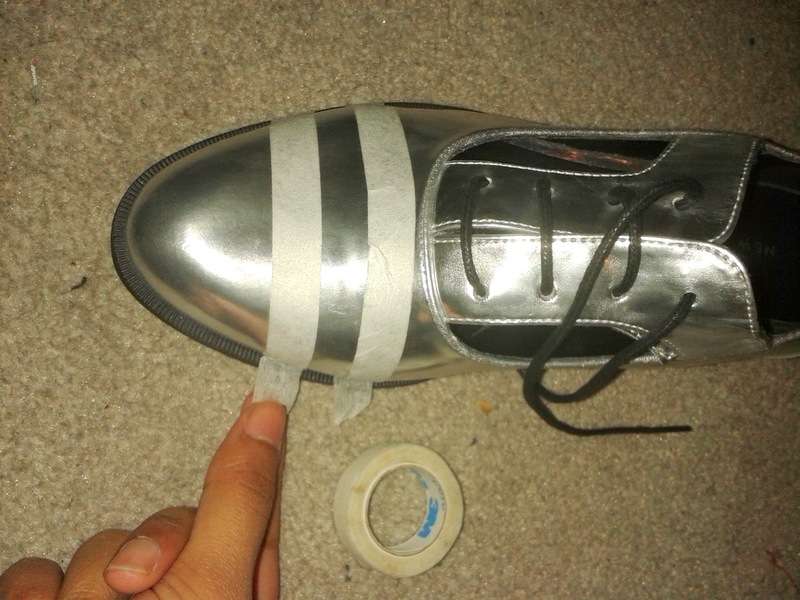 So, I started by covering a couple of sections on the shoes with the masking tape to isolate an area I'd like to start with. I started out with making my own tribal/aztec designs on the selected area. It was quite messy but actually not too bad to work with, I mean you could draw, just not that fine or detailed. 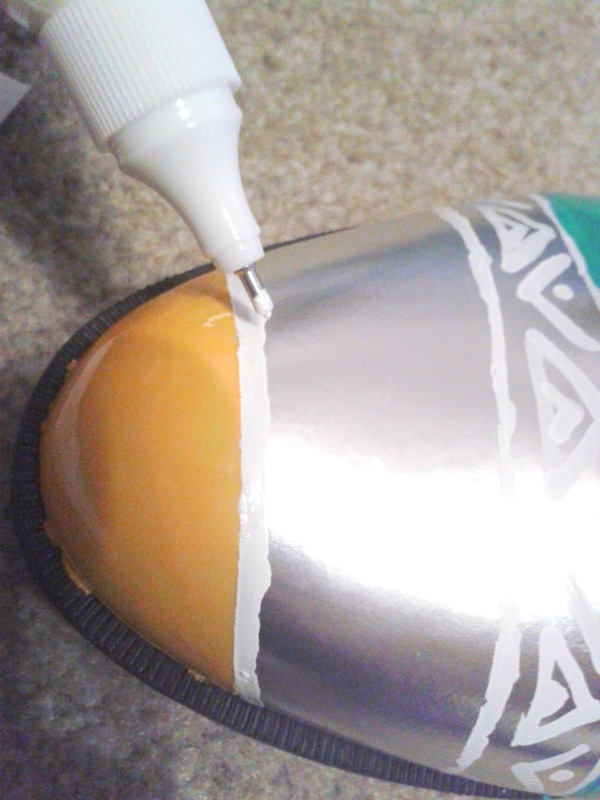 Next, I covered the next section with my masking tape to add colour. I used my trusty nail paints. 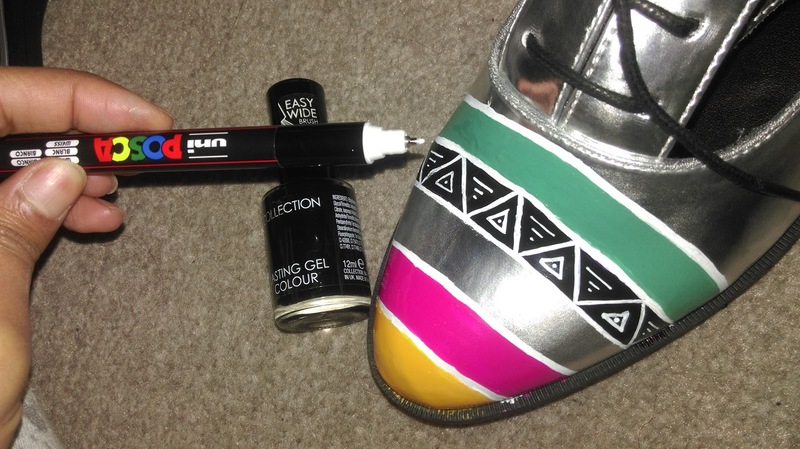 To be honest, I love working with nail paints, they are so versatile and vibrant! And if anything went wrong, it's so easy to remove them with remover. 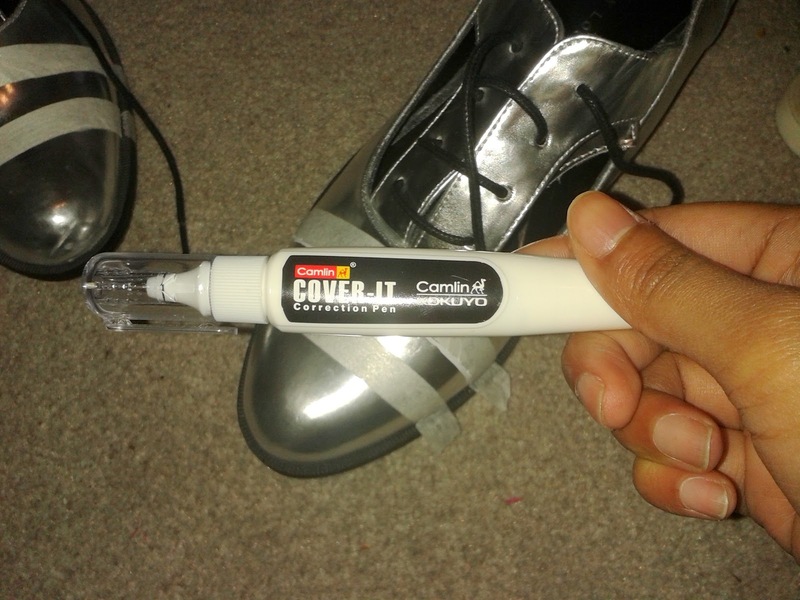 However, be wary since not all surfaces, especially painted surfaces, can resist varnish removers, and that is one of the issues I had with my shoes... Here are the colours I used: sunny yellow and berry pink by beauty UK and emerald jade green by Kelly Brook. I found that nail paints by both the companies work really well and smear very smoothly. So, I covered various sections and added colour on to them one after another. If you are confident with your control of colouring, you don't really need the masking tapes tbh. 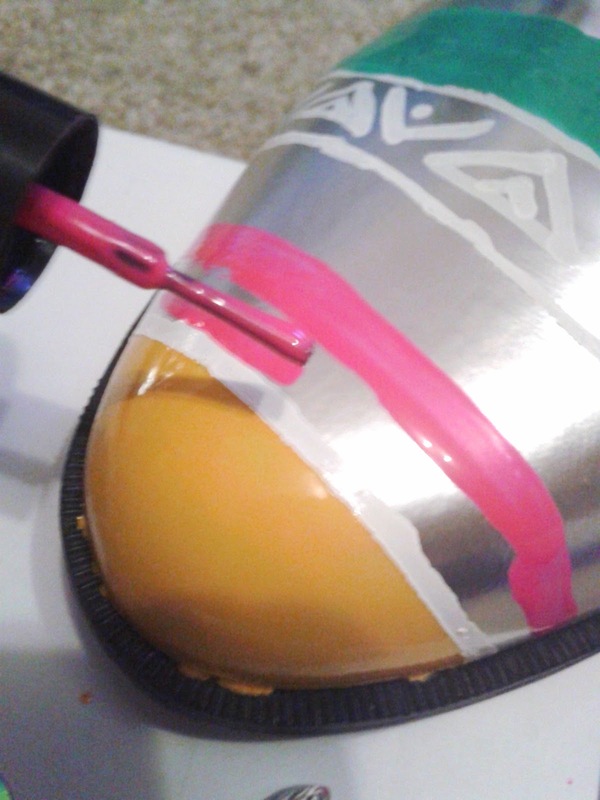 As a matter of fact, by the end of the DIY, I was doing free hand painting on the shoes since I didn't really care for neat straight lines. Use as many vibrant colours as you like. 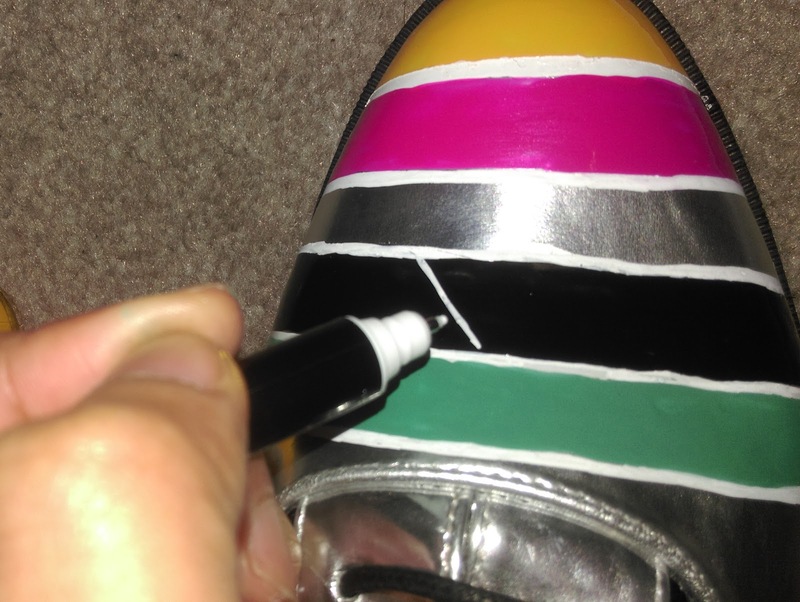 I coloured my shoe tip yellow and then added a white outline before colouring the next stripe bright pink. Well, like I said, I wasn't happy with the outcome I got from the correction pen, even though I thought it should have been fine on a smooth leathery surface like my shoes, so I swithched to my white marker (which I should have used from before, but I wanted to experiment anyway so nevermind...). 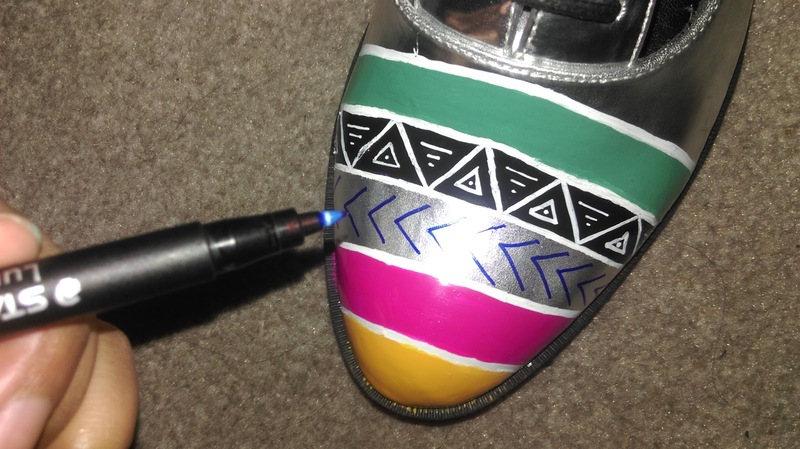 And so, I covered the correction pen part with black nail paint and drew some free hand tribal prints on top of that with the white marker and also went over the white lines between each section. 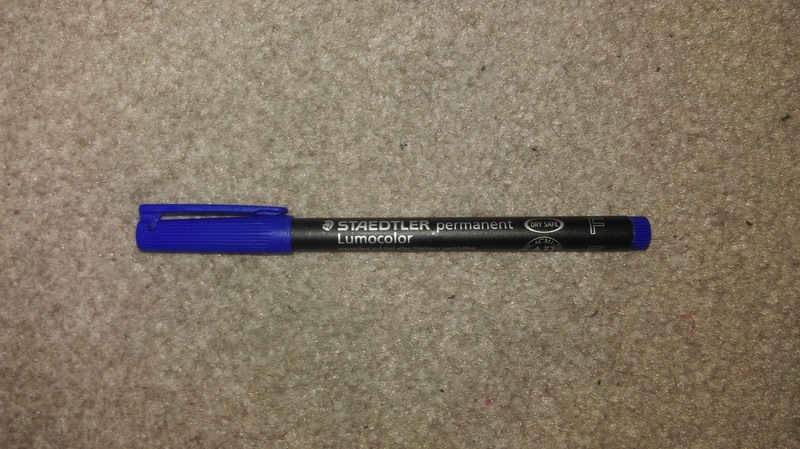 Lastly, I used my blue parmanent marker and did a little more tribal art on the last section left. 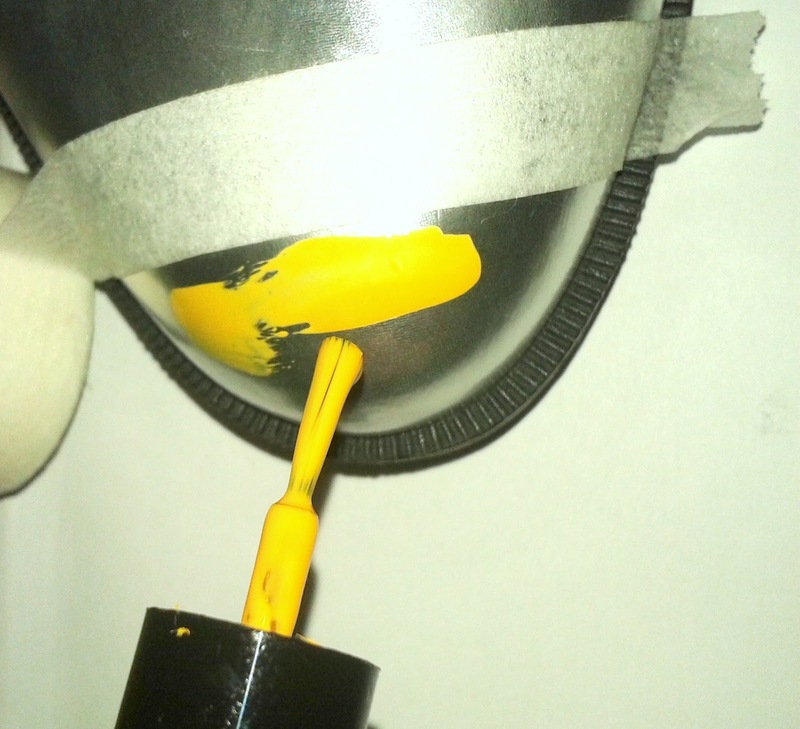 Once done, you can also spray over the colours with weather proof coat to prevent them from chipping and damage. 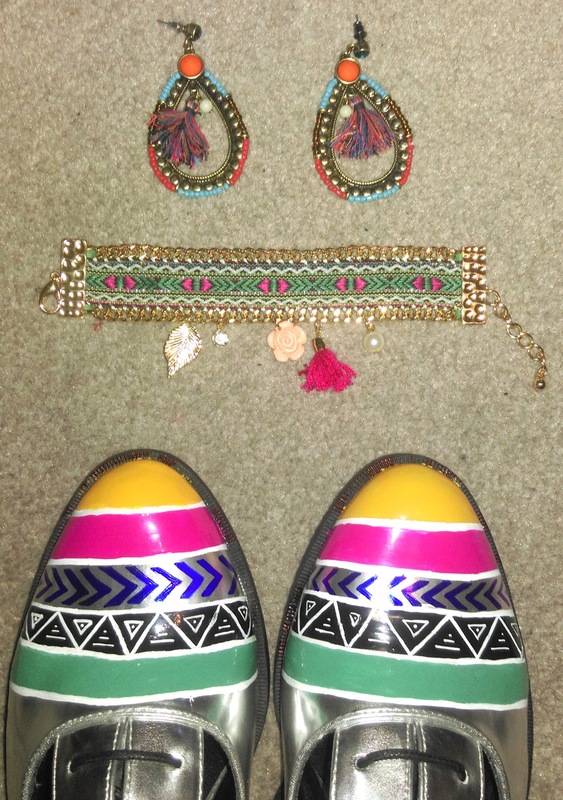 I love how it absolutely compliments and matches my tribal-ish colourful accessories. Now I am definitely ready for somewhere warm like Chile!! !